Cardinal Pietro Parolin, Vatican Secretary of State, traveled to Russia August 21-24, and everything went fine, according to reports. At a first sight, it seems too early to think about a possible trip to Moscow for Pope Francis, while it is more likely that we will see a second meeting between Pope Francis and the Russian Patriarch Kirill, after the first, historic meeting between a Pope and a Moscow Patriarch that took place February 12, 2016. Is the trip a sign that Pope Francis’s diplomacy toward the eastern European countries is succeeding? There is no simple answer to this question. One of the most developed topics around the trip is that of the so-called Vatican Ostpolitik. Ostpolitik describes the Holy See’s policy with the eastern bloc countries that were on the other side of the Iron Curtain. Ostpolitik was a diplomacy of dialogue, developed in the 60s by Msgr. Agostino Casaroli, later St. John Paul II’s Secretary of State. Ostpolitik was very much criticized within Church ranks, especially from the Cardinals of the Church of Silence, i.e., Cardinal Stefan Wyszynski, Primate of Poland, and above all Cardinal Jozef Mindszenty, Archbishop of Budapest-Esztergom. They both considered the Holy See’s approach as amounting to too much dialoguing with the countries of the Soviet bloc. Considering that Cardinal Parolin was trained under Cardinal Casaroli, his appointment as Nuncio to Venezuela was interpreted as a rejection of the Vatican Ostpolitik. His return to Rome, and his way of building bridges, was then interpreted as a return of Ostpolitik, to be applied in difficult situations like the relations with China. But can the discussion really be reduced to being for or against Ostpolitik? As always during this pontificate, it is noteworthy that the discussion has been carried on quasi political lines. Cardinal Parolin continues to garner ever more consideration within Church ranks. However, his defenders have also targeted those who criticized the Cardinal’s diplomatic approach, labeling them as clerical. To those who object that the Casaroli approach which Cardinal Parolin is said to be following is diplomacy without faith, Parolin’s defenders reply that both Parolin and Casaroli are directly inspired by their vocation. Perhaps it is the term Ostpolitik that does not work. Gian Maria Vian, Editor of the Vatican newspaper, L’Osservatore Romano, raised this point in a contribution he made to the book Agostino Casaroli: lo sguardo lungo della Chiesa. According to Vian, the term Ostpolitik is “easy and evocative”, but it is not “the most precise”, as it comes from the German policy of opening toward Communist countries. The Church’s opening started earlier. This is how “Pius XII becomes a target, at least since 1944, when attacks – also supported by the Russian Church – are launched against a Pope accused of being silent in front of the Nazi crimes, to the point of being an accomplice.” These were the effects of the Soviet Union’s Westpolitik, fed with disinformation. And this is how we get to Casaroli’s Ostpolitik. Casaroli was appointed Secretary of State by St. John Paul II. George Weigel, in his book The End and the Beginning, noted that John Paul managed the Holy See’s moves toward the countries of the Soviet bloc directly from the papal apartments. The Pope – according to Weigel – was not as intransigent as Cardinal Mindszenty, but not as “collaborationist” as Cardinal Casaroli was. Today, there is a different situation. The theme of communism as political power can be applied mostly to Asian countries, China and Vietnam above all. On the other hand, the Holy See’s dialogue with the countries of the former Soviet bloc is considered largely in terms of ecumenical dialogue. As there were Orthodox who supported the campaign against Pope Pius XII, there were also Orthodox who protested against the possible canonization of Cardinal Aloizje Stepinac of Zagreb, another martyr of the Church of Silence. Pope Francis responded to these critics by setting up a mixed commission that did not lead to any conclusion and saw everyone remaining fixed on their original positions. When it comes to relations with the Orthodox world, history is crucial. But for the Orthodox, it is mostly a political issue. Just as political was the approach taken by the Moscow Patriarchate to the Catholic Church. 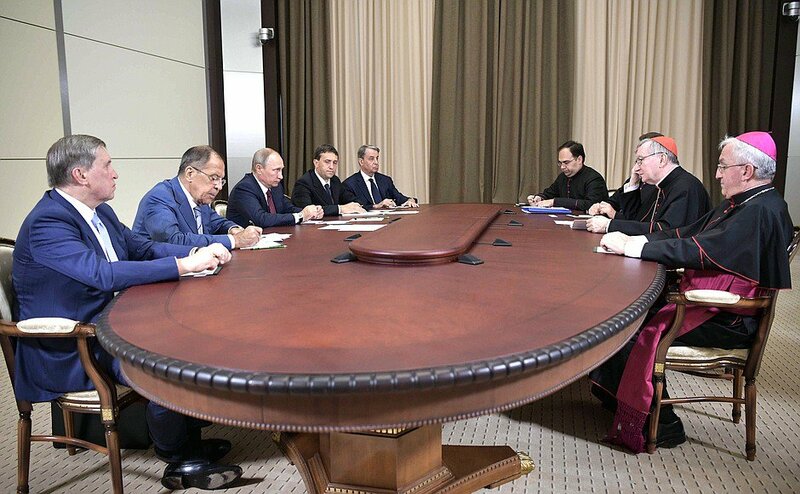 This rapprochement was partially suggested by the perceived need of the Russian Orthodox hierarchy to have same direct channel with the Holy See as that of Patriarch Bartholomew of Constantinople – especially in view of the Pan-Orthodox Synod which took place in June 2016 without the participation of the Moscow Patriarchate. But the rapprochement was also fostered by Russia’s need to have an international partner in these times of diplomatic isolation. 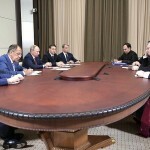 It is not surprising that during the meeting he had with Cardinal Parolin, President Putin showed his appreciation for the collaboration between the Moscow Patriarchate and the Catholic Church on the big issues of secularization and global peace: the Russian president is aware of the extraordinary role that religions have in shaping popular sentiment. Nor was it surprising that the meeting left some issues unresolved. It could not be otherwise. As are as the points in common are concerned, it is noteworthy that Cardinal Parolin had a long conversation with Russian Foreign Minister Lavrov. The two discussed the Ukrainian and Syrian crises. They also talked about the persecution of minorities in Middle East, especially the dramatic ones that involve Christians, and Lavrov agreed with Cardinal Parolin that minorities must be defended from the threat of Islamic extremism. On this point, Christians of the Middle East have an optimistic take on the Kremlin’s pro-Assad politics, given that Catholics in Syria were not under threat from Assad. Pope Francis himself was accused of “ecumenical correctness” – in John Allen’s words – for supporting Catholics with these positions. In Cardinal Parolin’s mind, one must “talk and try to look for the dialogue with everyone,” Moscow included. But there were also disagreements on other points, as Cardinal Parolin made clear during the press conference with Lavrov. One is the conditions of Christians in Russia. The Catholic Church in Russia has been asking for long time for a direct Vatican intervention in local situations where the freedom of worship is limited. Among these problems, is the issue of the Moscow real estate that once belonged to the Catholic Church and was seized in Soviet era, Msgr. Igor Kovalevsky, General Secretary of the Russian Bishops Conference, told Crux. Despite many declarations that claim the opposite, the local authorities have not yet returned many of these buildings and churches. Once again, history is crucial. It is for this reason that Cardinal Parolin emphasized that his visit had an ecumenical value. In Russia, there are 773,000 Catholics, representing just the 0.5 per cent of the population. “Every religious community needs an adequate place for worship, a church, a temple, to profess their faith,” Cardinal Parolin said to the Moscow Archdiocese’s bulletin. The theme of Catholic real estate seized in favor of the Orthodox Church is a key topic in every country of the former Soviet bloc. The Ukrainian situation is no exception. The Ukrainian situation was among the issues in the relations between the Holy See and the Moscow Patriarchate, though the situation was not mentioned in depth for diplomatic reasons. From the diplomatic point of view, everything was born out of the 1946 pseudo-Synod of Lviv, which forcibly joined the Ukrainian Greek Catholic Church to the Moscow Patriarchate while all the Greek Catholic bishops were under arrest. Despite the irregularities, the Moscow Patriarchate still considers canonical the Synod’s decision, though even those involved in the suppression of the 1596 Union of Brest have said that they were able to convert the Greek Catholic priests to Orthodoxy only with the help of the secret police. Today, the Russian Orthodox Church frequently condemns the terrorist actions of the Crimean activists. However, according to data of the secret police, the Russian Orthodox Church took active part in the violent liquidation of the Ukrainian Greek Catholic Church (Bohdan R. Bociurkiv, The Ukrainian Greek Catholic Church and the Soviet State (1939-1950). Canadian Institute of Ukrainian Studies, Edmonton 1996.). No amount of scientific publishing nor the secret documents published so far have brought the Moscow Patriarchate to tell the truth. And this is not the only case. The Greek Catholic Church chose the catacombs. It was prepared to do so since 1939, when Bolsheviks arrived in the western Ukraine and Metropolitan Sheptytsky immediately foresaw that a repression was in the offing. Sheptytsky send a letter to Rome, saying he was prepared to die for the Church, and predicted difficult times for the Church in 1944, shortly before dying. His faithful were ready. When the Greek Catholics emerged from the catacombs, they struggled to regain what was previously theirs. This is what the Russian Orthodox still labels as proselytism. This issue was part of the Cardinal Parolin’s talks in Russia. It shows that the real problem is always history. Until now, the eastern diplomacy of Pope Francis has mostly aimed to deal with concrete issues: from the diplomacy of the relics to the ecumenical one, from the diplomacy performed in order to protect Christians to that in favor of the family. The gaze set on the East consists in dialogue, from the historical point of view as well, as the commission set up to clarify the positions of Cardinal Stepinac shows. Now, everyone is waiting for a possible trip to Russia by Pope Francis. The hope is that, as a consequence of the trip, dialogue will be carried out in a more consistent way, involving a reconciliation with history, before a theological or pragmatic reconciliation will take place.